p14ARF is a protein product of the alternative reading frame of the human INK4a locus. It functions as a tumor suppressor protein. p14ARF suppresses growth through p53-dependent and p53-independent pathways. p14ARF protein localizes primarily to the nucleoli. Here we show that in transfected cells p14ARF also appears in Hsp70 positive extranucleolar inclusions. The formation of p14ARF inclusions induces the parallel re-localization p53 and HDM2 to these sites that are also targeted by PML bodies and proteasomes. Our data show that co-localization between p53, HDM2 and p14ARF occurs at extranucleolar sites. Accumulation of PML and proteasomes at these sites suggest that the components of the nuclear inclusions are targeted for proteasome-mediated degradation. The INK4a locus on human chromosome 9p21 encodes the p14ARF tumor suppressor protein, which uses an upstream promoter and a shifted frame in exon 2 (compared to the p16 protein) [1, 2]. The INK4a locus is often inactivated by deletion or by methylation in human melanomas, lymphomas, and other tumors [3, 4]. p14ARF has the ability to suppress growth through multiple p53-dependent or p53-independent pathways [5–7]. p14ARF protein binds to HDM2 and inhibits its E3 ubiquitin ligase activity . p53 is a binding partner and ubiquitination target of HDM2 [9–11]. In cells that harbour wild type p53, p14ARF can associate with p53 bound HDM2 forming tri-molecular complexes [12, 13]. In human tumor cell lines, p14ARF is localized mainly to nucleoli [13, 14]. The nucleolus is one of the most characterized nuclear compartments [15, 16]. Nucleoli are assembled around clusters of repeated ribosomal genes, which are transcribed by RNA polymerase I. The nucleoli are the sites of ribosomal biogenesis. They are also sites for the maturation and processing of small nucleolar RNA . Nucleoli play an important role in the replication of different viruses . It was suggested that p14ARF targets HDM2 protein to the nucleoli, blocking the shuttling of HDM2 to the cytoplasm, and consequently enriching the nucleus with p53 protein [13, 19, 20]. However, the literature data shows contradictory data about p14ARF-HDM2 localization reporting that p14ARF targets HDM2 to the nucleoli , HDM2 re-localizes p14ARF to the nucleoplasm , or these two proteins are found in different compartments . In the present study, our goal is to verify the localization of p14ARF protein and to compare it with the localization of other regulatory proteins, such as p53, HDM2, Rb, p27, Hsp70, and PML. 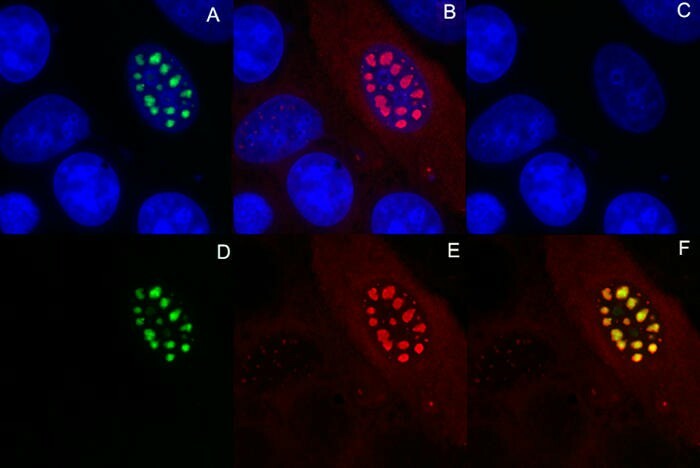 We transfected p14ARF, cloned into three different vectors: pBabe that did not contain any tag (pBabe-p14ARF), and as a fusion with GFP at the N-terminus (GFP-p14ARF) and with DSRed at the C-terminus (p14ARF-DSRed) into MCF7, Saos-2 and NIH3T3 cells lines. The three different constructs produced proteins with very similar localization patterns in all the three cell lines. Pictures that were taken on MCF7 cells are used to illustrate the findings of this paper. We found that p14ARF protein accumulated in the nucleoli and/or in extra-nucleolar nucleoplasmic inclusions of variable sizes (Figure 1). 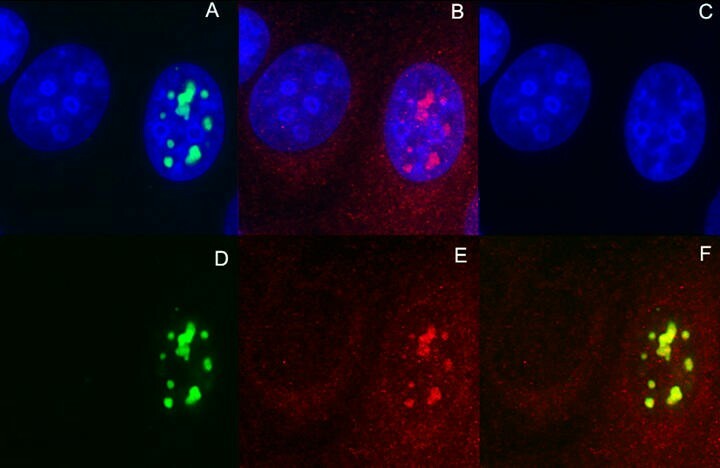 These p14ARF nuclear inclusions were negative for the nucleolar marker B23 (Figure 2) and were not surrounded by perinucleolar heterochromatin. It was difficult to distinguish nucleoli from the extranucleolar inclusions using only phase contrast microscope. The p14ARF nuclear inclusions were visible on the phase contrast as dark bodies in similar manner as nucleoli. We found however that staining of the perinucleolar heterochromatin with Hoechst 33258 was a reliable marker to routinely discriminate between nucleoli and extranucleolar inclusions. Full-length p14ARF expressed from the retroviral vector pBABE (pBabe-p14ARF) is localized to the nucleoli (full arrowheads) and to extra-nucleolar inclusions of MCF7 cells (hollow arrowheads). DNA – staining is shown in blue. Double staining for B23 and pBabe-p14ARF shows that pBabe-p14ARF forms extranucleolar inclusions as well as localizes to nucleoli in MCF7 cells. Red – B23, green – p14ARF, blue – DNA staining. After p14ARF transfection, we observed that PML bodies were re-distributed to the p14ARF nuclear inclusions (Figure 3). PML and p14ARF proteins showed a high level of co-localization. However, PML protein was not detected in the nucleoli that contained p14ARF protein. Here we demonstrated a striking difference in the properties of the nucleolar p14ARF and p14ARF that formed extranucleolar inclusions. PML bodies are randomly scattered in nuclei where pBabe-p14ARF exclusively localized to nucleoli (top row) but gradually associate with the p14ARF positive extranucleolar inclusions in parallel with their expansion (2nd–5th raw) in MCF7 cells. p14ARF positive nuclear inclusions are denoted by hollow arrowheads and nucleoli by full arrowheads. Green – p14ARF, red – PML protein, blue – DNA-staining. In order to investigate whether the p14ARF nuclear inclusions could be targets of the degradation pathway, we have stained the transfected cells for the 20S core subunit of the proteasomes. The 20S subunits of the proteasomes were localized mainly to the cytoplasm of MCF7 cells. 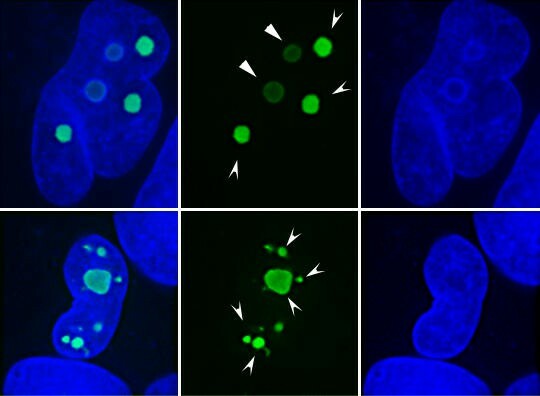 When p14ARF was expressed in cells, the 20S core subunits of the proteasomes were targeted to the nucleus and co-localized with p14ARF in the extra-nucleolar inclusions (Figure 4). Remarkably, the proteasomes were not associated with p14ARF when it was present in the nucleoli. 20S proteasomes are targeted to pBbae-p14ARF positive nuclear inclusions (hollow arrowheads) but not to the nucleoli (full arrowheads) in MCF7 cells. Green – p14ARF, red – 20S proteasome subunits, blue – DNA-staining. One of the stress response proteins, Hsp70, is often redistributed both to the nucleus and to the nucleolus during periods of cell stress. Here we show that in those p14ARF transfected cells where p14ARF accumulated in the extranucleolar inclusions Hsp70 was targeted to the nucleus and showed a high grade of co-localization with p14ARF extranuclear inclusions (Figure 5). 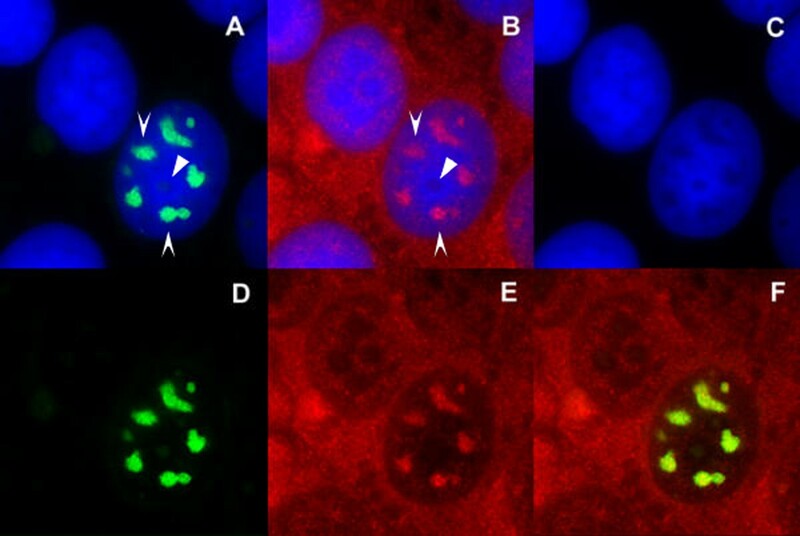 No Hsp70 accumulation was observed when the transfected p14ARF gathered in the nucleolus. HDM2 protein (red) is re-distributed to pBabe-p14ARF (green) nuclear inclusions, but not to nucleoli that contain p14ARF in MCF7 cells. DNA staining is shown in blue. We stained the cells for both p53 and HDM2 because these two proteins were shown to form a tri-molecular complex with p14ARF protein. Both proteins were found in the extra-nucleolar p14ARF inclusions. 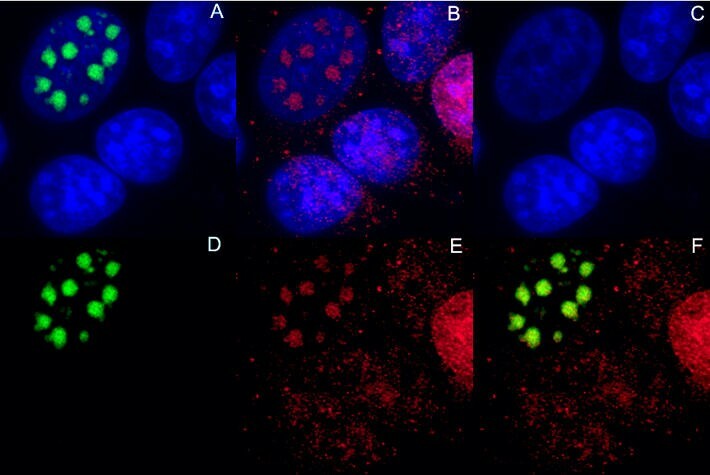 Neither protein was detected in nucleoli, even if p14ARF was localized to the nucleoli (Figures 6 and 7). Formation of the p14ARF inclusions has no effect on the distribution of other nuclear proteins such as pRb or p27 (data not shown). Transfection of p14ARF into MCF7 cells that contain wild type p53 and HDM2 but lack endogeneous p14ARF did not induce increased expression of p53. 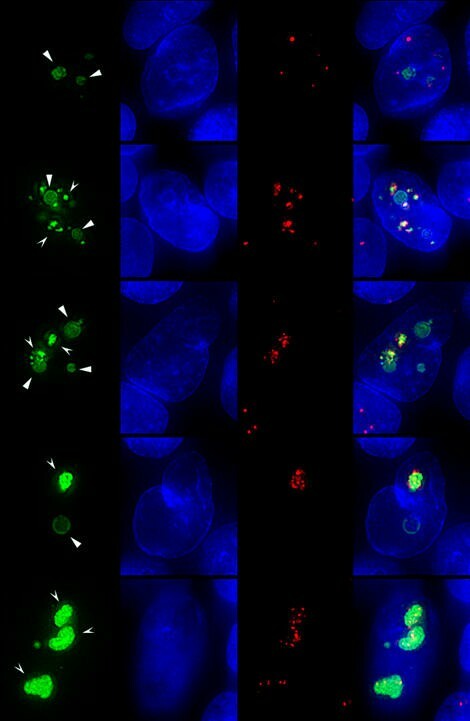 p53 protein (red) co-localizes with pBabe-p14ARF (green) in the extra-nucleolar inclusions in MCF7 cells. DNA staining is shown in blue. pBabe-p14ARF extra-nucleolar inclusions, but not the nucleoli, are the sites for the accumulation of Hsp70 protein in MCF7 cells. Green – p14ARF, red – Hsp70, blue – DNA staining. p14ARF protein is considered to be mainly nucleolar protein that directly interacts with HDM2 and regulates the expression of the tumor suppressor protein p53. p14ARF also appears to have a p53/HDM2 independent tumor suppressor function on its own . The sub-cellular localization of p14ARF/HDM2 complex is still controversial. 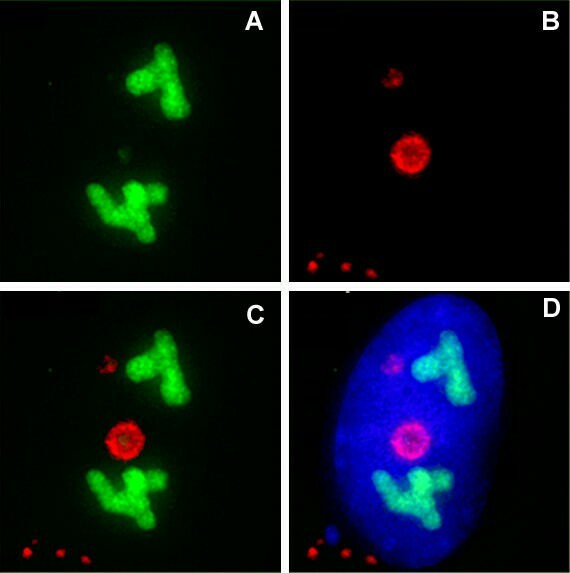 Experiments on cell hybrids suggested that p14ARF sequesters HDM2 in the nucleolus . On the other hand it was also shown that overexpressed HDM2 protein could re-locate p14ARF into the nucleoplasm in the presence of wild-type p53. We have detected the formation of nuclear inclusions by p14ARF that was expressed from three different vectors, 24–72 hours after transfection. Overexpressed HDM2 was not required for the formation of the inclusions. The nuclear inclusions were very similar in size, and in appearance in phase contrast microscope, to the nucleoli. The lack of B23 protein and the absence of surrounding perinuclear heterochromatin clearly indicated that the inclusions were extranucleolar structures. PML bodies regularly targeted the p14ARF inclusions, but not the p14ARF containing nucleoli. PML bodies are interferon inducible, multifunctional nuclear organelles that are involved in a number of cellular processes such as antiviral defence, MHC class I dependent antigen presentation and regulation of gene expression. PML bodies also likely play a role in the regulation of the degradation of nuclear proteins. For example mutant, misfolded influenza nucleoprotein accumulates in PML bodies in cells where proteasome mediated degradation is inhibited suggesting that PML bodies function as the nuclear analogues of the cytoplasmic aggresomes . Accumulation of mutant polyQ-containing cellular proteins in polyglutamine (polyQ) neurodegenerative diseases  leads to the relocalization of PML bodies to the polyQ inclusions . We also observed that the p14ARF nuclear inclusions, but not the p14ARF containing nucleoli, showed accumulation of Hsp70 protein and were targeted by proteasomes. Importantly HDM2 and p53 also accumulated in p14ARF inclusions but when p14ARF was localized to the nucleoli, p53 or HDM2 co-localization was not detected. Our data suggests that p14ARF, although it often accumulates in the nucleolus, does not sequestrate HDM2 in the nucleolus. The complexes localize to the nucleoplasm. p14ARF/HDM2 complexes also contain p53 and are targeted for proteasome mediated degradation with the help of PML bodies. Overexpression of p14ARF leads to the complete entrapment of HDM2 and p53 intro extranucleolar inclusion bodies. Our data show that co-localization between p53, HDM2 and p14ARF occurs at extranucleolar sites. Accumulation of PML bodies and proteasomes at these sites suggest that the components of the nuclear inclusions are targeted for proteasome-mediated degradation. The following plasmids were used: full-length p14ARF cDNA (encoding 132 residues), cloned in pBabe vector (gift of Klas G. Wiman – CCK KI, Stockholm); and full-length p14ARF fused to GFP in pEGFP-C1 and to DSRed in pDsRed2 (both Clontech) in C-terminal and N-terminal positions, respectively. In this study, MCF7, a breast cancer cell line, Saos-2, an osteosarcoma cell line, and NIH3T3, a mouse immortalized fibroblasts were used. MCF7 cells expressed wild-type p53 at low levels, HDM2 at moderate levels and had a deleted p14ARF gene. Saos-2 cells had a homozygous deletion at the p53 loci and expressed moderate level of p14ARF. Cells were cultured in Iscove's medium as described elsewhere . The culture was mycoplasma free as shown by Hoechst DNA-staining. Transfections were performed using the LipofectAMINE PLUS Reagent and FuGene (Life Technologies) according to the manufacturer's protocol. The cells were grown and transfected on cover slips. rabbit polyclonal anti-p14ARF, a kind gift of K. Wiman (CCK, KI, Stockholm). Normal mouse, swine, and rabbit sera were obtained from DAKO. Bisbenzimide (Hoechst 33258 from SIGMA) was added at a concentration of 0.4 μg/mL to the secondary antibody for DNA staining when needed. Cells were stained on coverslips after fixation in a mixture of methanol and acetone (1:1) at -20°C. The immunostaining protocol has been described previously . Images were captured using a DAS microscope Leitz DM RB with a Hamamatsu dual-mode cooled charge-coupled device (CCD) camera C4880. The 3D immunofluorescence images were generated from the reconstitution of a series of de-blurred optical sections. Briefly, the images were captured using a PXL cooled CCD camera (Photometrix) on a Zeiss Axiophot microscope equipped with Z-axis motor, external shutter and excitation filter-wheel, controlled by a MAC2000 LEP module. The computer program, ST-RFH-bin2, that controlled the image acquisition hardware and produced the digital images was developed by us (Szekely, unpublished). The program captured three times 13–17 images from three excitation series (Rhodamine-FITC-Hoechst) with focal planes 0.3 μm apart. The incoming images were automatically corrected for dark current noise and optical shining through, and de-blurred using a nearest neighbour de-convolution algorithm. The resultant image stacks were projected using the maximum intensity projection algorithm producing a single-direction and stereo-pair projected images as described . Elena Kashuba, Karin Mattsson contributed equally to this work. We thank Klas G. Wiman for the p14ARF plasmids and anti-ARF antibodies and P. K. Chan for anti-B23 antibodies. This work was supported by Cancerfonden and by a matching grant from the Concern Foundation, Los Angeles, the Cancer Research Institute, New York and also by SSMF (Swedish Society for Medical Research), Karolinska Institute and Sven Gard Foundation.